After registration, I sat down with some other members at a small table not too far away. We all dug into our NCECA bags like it was Christmas, and then dove into our program schedules. I circled the events for the day (last year I was frantically running around everywhere with no plan), and headed to the Gallery Expo. After gawking at the initial displays, I made my way over to the Artstream Nomadic Gallery, easy to identify with their classic metal trailer. I learned from the salesman there that much of the work was fresh from the kiln, and that he’d helped unload Lisa Orr’s mugs the day before. I knew then that it was the time select the mug that I’d been saving up for, but so many choices! I narrowed it down to two: Tara Wilson (left) and Josh DeWeese (Right). I ended up going with Wilson’s, and I love it! While recovering from my post-mug-purchase daze, I bumped into Speedball’s demonstrator Jeffery Blandford. He was throwing with metallic clay that he explained had trace amounts of coal in it. Jeff also showed some impressive pinky skills (see picture)! Then I got to listen to Linda Swanson present her work and processes. She discussed movement in her pieces, like one glass bowl with bentonite and water, which moves like a cloud and transforms over time. She also discussed the embracement of techniques which are usually seen as mistakes, purposely shaping the cracks and bubbles in creative ways. Now that I think about it, that’s such a motto for life: Master the mistakes! 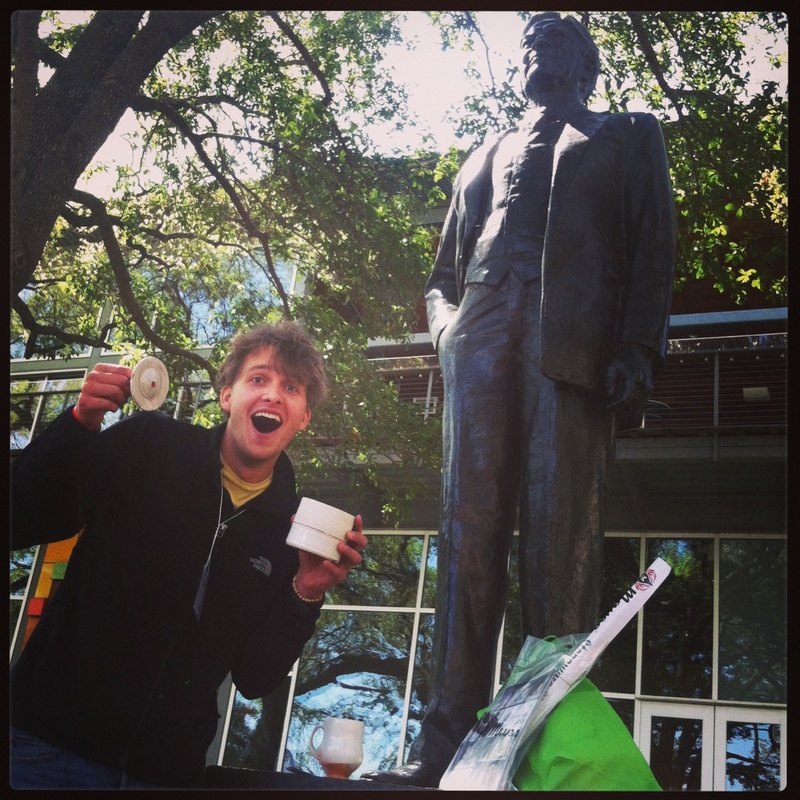 It’s the first day at the cup sale and the amazing cups and mugs are beginning to accumulate! 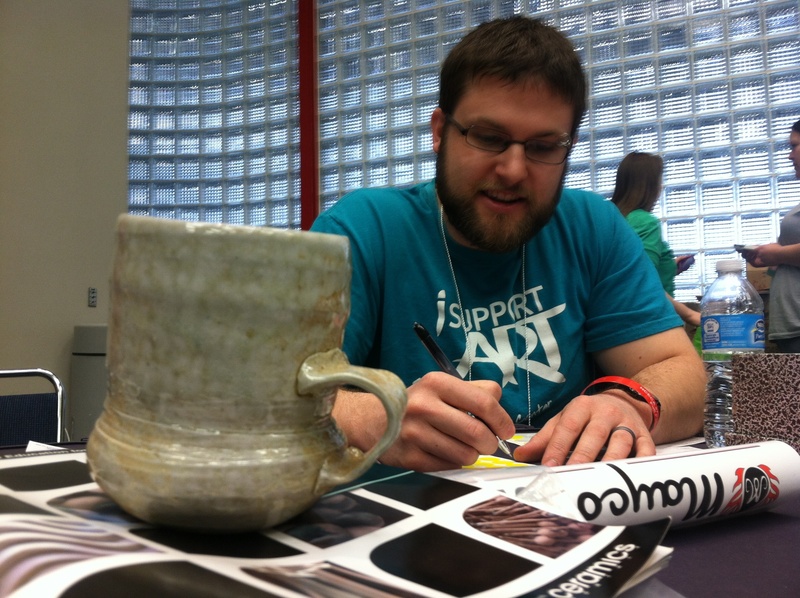 I love the cupsale; it allows members to leave a part their work and theirselves for the organization and for the NCECA community. I wish could put a little camera in my mug to see who pics mine up! 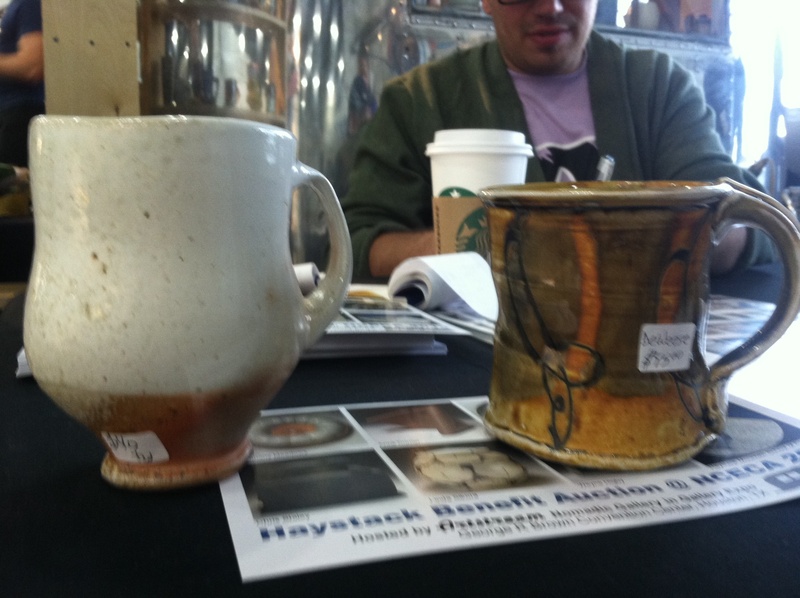 For this year’s cup sale, I brought a salt-fired porcelain mug – keep your eye out for it! Hidenseeka is more than just a clever play on words, it’s a brilliant event where instagram-savvy NCECA members follow clues to pottery hidden near the conference center. Ever since I heard about this event, I’ve obsessed about being one of the lucky people to find a pot. And it happened!! I had to dive through some bushes to snag it, but around lunch time I saw the clue, and spotted a small jar behind a statue. It’s an Alex Watson lidded jar, and it will hold my sugar forever <3. 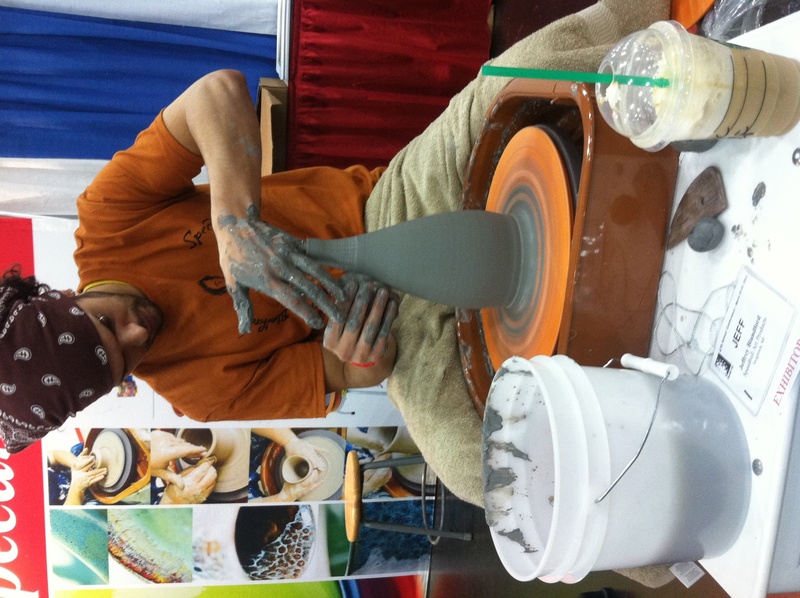 One of my favorite parts of NCECA’s process is their inclusion of different disciplines. To refuel the inspiration of our ceramic art, branching out to unknown territory can be wildly refreshing. Watching Keynote Speaker Janine Antoni speak about her work with such confidence and articulation was truly inspiring, and really made me think. Such powerful symbols! And watching Bill Bower’s performance was breathtaking. I didn’t think I would become so emotional, but the fact that it was based on true experiences, and so passionately described, had a surprisingly powerful impact on me. What a great way to begin the conference! Duncan, truly an eloquent piece, I could see the whole event through your experience. Keep that enthusiasm for clay close at hand for when they really count in the studio. Enjoy the rest of NCECA. Duncan, your enthusiasm is contagious! From the time when I first met you working on this blog post, to every time I saw you throughout the conference, you were smiling and looked like you were having the time of your life! I also appreciated your suggestions about maps and public transit info for more rural attendees from the open board meeting. I hope you stay involved in the organization, and I look forward to reading more from you! Thank you so much for the opportunity! I had an absolute blast in Houston. I look forward to seeing you in Milwaukee!